Kim Kardashian is one of an elite group of celebrities that will log off of Facebook and Twitter starting this Wednesday in support of World Aids Day. The star has pledged not to log back onto the social networking sites until $1 million has been raised for Keep A Child Alive, a charity hosted by Alicia Keys. The ladies will be joined by Lady Gaga, Justin Timberlake, Usher, Serena Williams, Khloe Kardashian and more. 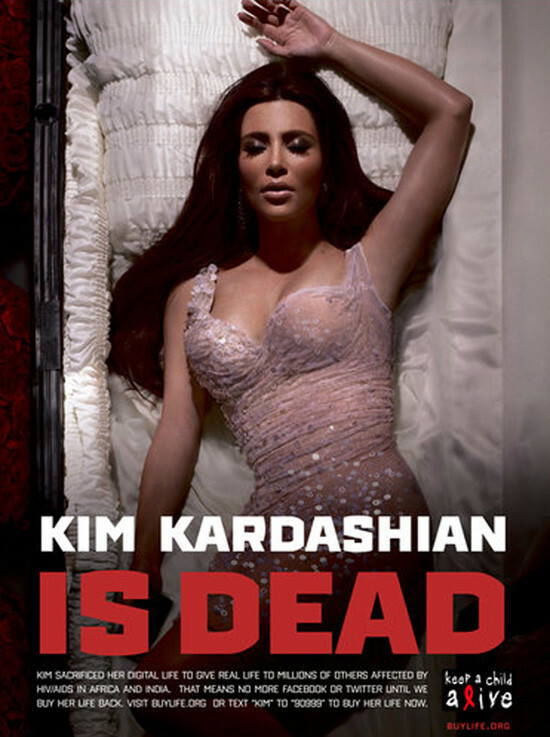 Kim's slogan reads: Kim sacrificed her digital life to give real life to millions of others affected by HIV/AIDS in Africa and India. That means no more Facebook and Twitter until we buy her life back. Visit BuyLife.org or text 'Kim' to '90999' to buy her life now.